Our aim is to help all learners make best use of our services to support their work or studies, whether on campus or at a distance. We are also committed to the further development of an inclusive learning environment. These services are provided in Catalyst on the Ormskirk campus, the Aintree Library located at University Hospital Aintree, Liverpool and St James, Manchester. This site will provide you with an introduction to the wealth of resources (both real and virtual) available plus the staff expertise to help maximise these resources. Whatever your learning preference and need, our staff can provide direction, support, and guidance. We aim to be responsive to both learners’ needs and to the University’s strategic focus and direction. Learning Services holds the Customer Service Excellence award. We have recently published our annual report for 2015/2016. The report covers a review of the services and support we provide including key statistics. Our service standards set out the level of service customers can expect in key areas of Learning Services activities. These standards have been produced in consultation with our customers and monitor quality, timeliness and access to facilities and services. 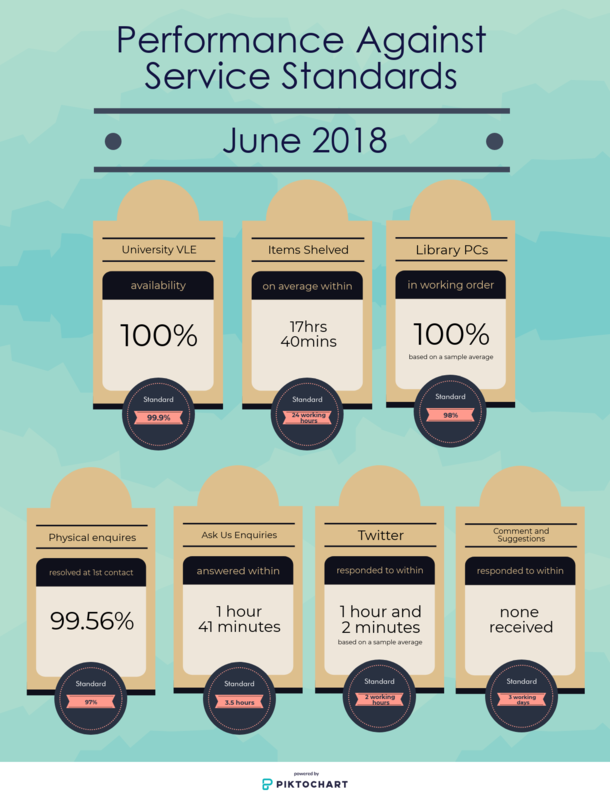 Our performance for June 2018 Performance Against Service Standards. Please do let us know what you think of our service standards, we want them to reflect what is is important to you, our customers. If you would like to provide any feedback on the standards, or would like more information about how we maintain and monitor the standards, please email Helen Jamieson helen.jamieson@edgehill.ac.uk. We are committed to providing high quality services, resources and facilities to all our customers. One of the ways we achieve this aim, is to use key performance indicators (KPIs). Our KPIs for 18/19 are based around our values of customer service excellence, operational excellence and staff engagement. Our performance against our KPIs is assessed every term and published annually. Contact our help desk on 01695 650800 from 8.00am to 8.00pm Monday to Friday and 10.00am to 6.00pm at weekends, please check our opening hours outside of University term time. If you have any comments or suggestions about our service we welcome your feedback. The following statement explains how Learning Services manage the personal data you may disclose to us e.g. when using the library system and resources, Learning Edge, booking and appointment systems and making enquiries. Our aim is to respect your privacy and comply with the General Data Protection Regulation (GDPR) (Regulation (EU) 2016/679) and the Data Protection Act 2018. The data you supplied on registering with the University is held under the terms of the Data Protection Act 1998. Some personal information is used to facilitate your library membership and access to the Learning Edge virtual learning environment. You may also provide some personal information on other occasions, for example, when contacting the Library with an enquiry, setting up an appointment or accessing our SpLD support services. We are committed to ensuring that your personal data is secure. In order to prevent unauthorised access or disclosure, we have put in place procedures to safeguard and secure the information we collect from you. The Library manages library interactions through the Soprano Library Management System (LMS) from Capita, Discover More via Summon from ProQuest, a referencing citation tool RefWorks, and reading lists through Talis Aspire. We also use the Connect 2 system to manage media equipment loans. These systems are hosted on secure servers off campus but are subject to the code of conduct for staff and students. In using any of these tools, there will be some data which is stored and used depending on the service being accessed. Data about loans are not divulged to third parties. If an item on loan to you is required by another user, the Library will act as broker and recall the item anonymously on behalf of the requestor. It is in the University’s and your legitimate interest to use databases of resources provided by third parties. However, please be aware that if you choose to use the added functionality of external sites, for example Lynda.com or Box of Broadcasts, to create personalised lists of resources, they will have different privacy notices. The University strongly advises that you read any privacy notice from such third parties before engaging with their services. We use electronic forms to gather personal information for purposes directly related to a service e.g. requesting help and support. Email enquiries to general email addresses or individual members of staff may also include personal information. The information collected will only be used in relation to that service or purpose for which it was given. Ask Us is the online knowledge base which includes the opportunity to email the help and support team. Contact with the team is managed through Springshare. EHU Central is the University’s mobile platform and provides a single point of access to apps including Learning Edge, library catalogue, Discover More, PC availability, news and events. Your contact information, for example your name, Edge Hill email address, username is obtained in order to administer your account and enable you to interact with the apps,. The EHU Central platform is managed by Modolabs. See the Learning Edge Privacy Notice for Learning Edge tools and systems. Deliver our contract to provide help and support and training to you Article 6(1)(b) – this is necessary for the performance of our contract with you. Without it we will not be able to process your request for support. Article 6(1)(e) – this is necessary for our legitimate interests. Deliver our contract to provide academic support to you. Article 6(1)(e) – this is necessary for our legitimate interests. Contact you with regard to any matter arising from your booking or attendance at your tutorial/drop in session e.g. cancelled sessions etc. Occasionally your tutor / The University may request details of your attendance. Article 6(1)(b) – this is necessary for the performance of our contract with you. We do not disclose booking data to any other parties without your written consent. Where you require us to make Reasonable Adjustments to enable you to attend a session or sit an exam, we may require further information from you. If this includes information about your physical or mental health, such information (being sensitive personal data (Special Categories Data)), will only be used by us, with your explicit consent, to assess your eligibility for Reasonable Adjustments. We will not share or disclose it to others. The legal basis upon which we do this is set out in Article 9(2)(a) of GDPR (explicit consent). You can withdraw your consent at any time by contacting us. Please note that we may not be able to process your request for Reasonable Adjustments if you withdraw consent. Editshare is a media asset management system for media students and some staff. User accounts are created manually with student or staff personal information – this allows them to have space on the system for uploading, editing and storing large media files required for their programme of study. It is a secure, closed local area (LAN) network. Personal data captured will include your name, e-mail address and student/staff ID. Information about your programme and module enrolments will also be associated with your account. You are in complete control. You can object or withdraw your consent to the use of your personal data at any time. Though in some cases we may not be able to provide your requested service (e.g. as a student or member of staff) where the information processing is an integral part of the service. We will tell you if this is likely to be the case. The following statement explains how the personal data you may disclose to us when using Learning Edge is used. The data you supplied on registering with the University is held under the terms of the Data Protection Act 1998. Some personal information is used to facilitate your access to the Learning Edge virtual learning environment and engagement with some of the third-party tools integrated within it. This personal information is transferred to Learning Edge systems in order to provide you with appropriate access to a range of teaching, learning and assessment functionality and support. Data will include your name, email address and student/staff ID. Information about your faculty, department, programme and module enrolments will also be associated with your account in some Learning Edge systems (e.g. Blackboard, Lynda.com, Ask LTD). You may also provide some personal information on other occasions, for example, when submitting work for assessment to either the Blackboard or Turnitin systems. When you use Learning Edge systems, information sent by your browser or mobile device, including information about the pages you visit, the content you upload and the messages you write, will be automatically logged in the relevant system. The systems that make up Learning Edge are hosted on secure servers off campus but are subject to the code of conduct for staff and students. Learning Edge may also contain links to other tools and systems. It is in the University’s and your legitimate interest to use these. However, please be aware that if you choose to use the added functionality of some external sites, for example eShare, Lynda.com, or Box of Broadcasts, to create personalised lists of resources, they will have different privacy notices. The University strongly advises that you read any privacy notice from such third parties or websites before engaging with their services. When you follow a link to an external website you should read their privacy policies. We use your personal information to provide you with access to the technologies and content that you need to work or study at Edge Hill University and to help us improve these products and our services. System Administrators use your personal information to manage the system services for staff and students, and also use anonymised activity data to monitor and evaluate system usage. IT Services and Catalyst Help Desk staff may, with your consent, access your data to help trouble shoot problems and offer advice and support. We keep our privacy notice under regular review and will update this document to reflect any changes. This privacy notice was last updated on 30 May 2018.